When used correctly, a vignette can be used to guide the eye or add a subtle frame to a photo and the most common way to create one is digitally with the help of software such as Adobe Photoshop, and Photoshop Elements. 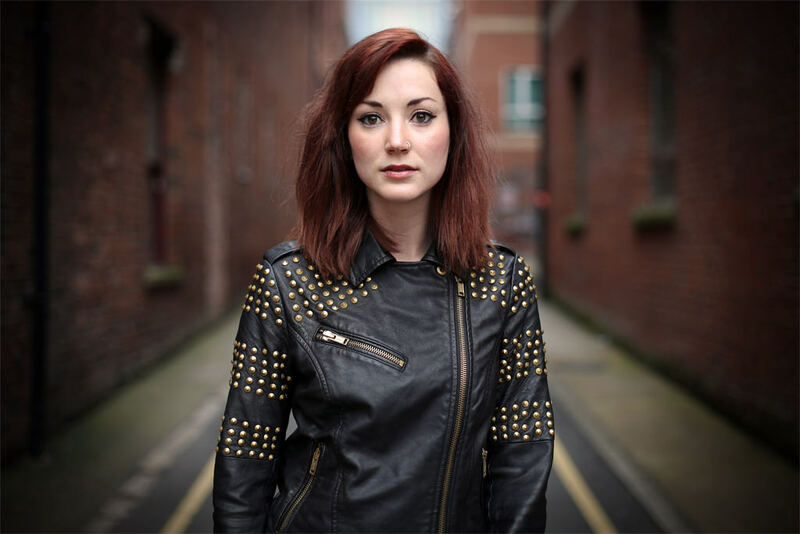 Vignettes are rather straightforward things to create and add to an image but there are various methods you can use to create one so, for this reason, we're sharing four methods that can be used to create a vignette successfully in Photoshop. You can use the below list to jump to a specific method or have a read through the whole article if you're unsure which method's best for you. The most common way of creating a vignette is with the Marquee tool which you then feather, inverse and darken the selected area to create your vignette. Select a Marquee tool, the Elliptical Marquee tool works best, and in the top toolbar find the Feather option. By inputting a value here you will basically soften your selection so the edges aren't as straight and harsh. In other words, it blurs it slightly, making the transition between the selected and none selected areas more smooth and not as obvious. The amount you enter in the Feather Radius box depends on the size of the file. If it's a small file set a radius of around 50-100 pixels, if it's a large file set a larger radius. To further smooth the selection when using the Elliptical Marquee tool make sure anti-aliased is ticked next to where you input a figure to change the feather options. To draw out your shape press and hold your mouse button while you drag your shape out over the image. Once you let go the selection will look like it's moving, this means we are ready for the next step. Next, go to Select > Inverse and the selection will switch so the outside of the image is now selected so when we apply the adjustment, the outside of the image will be the part that changes, adding a subtle frame to the shot. To create the vignette you can make a Brightness / Contrast adjustment and simply drag the brightness slider to the right to darken the selection or the opposite way for a light vignette.  To apply the Brightness / Contrast adjustment go to: Image > Adjustments > Brightness / Contrast or click on the black & white circle found at the bottom of the layer's panel and select it from the list that pops up. 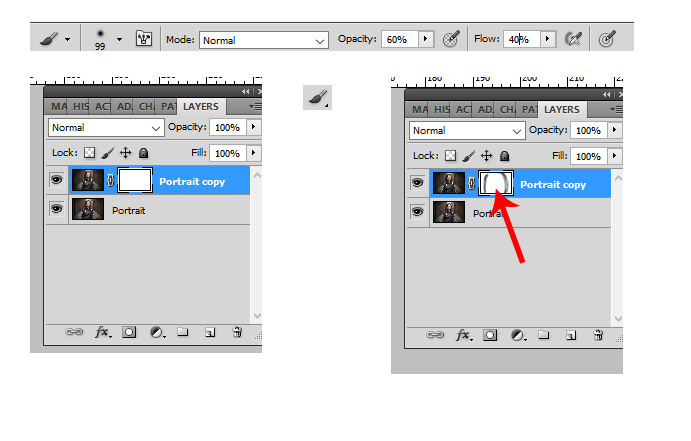 First, duplicate your layer by either dragging the original layer over the new layer icon (circled in red on the image below) or by going to Layer>Duplicate Layer. We do this so we always have the original image to go back to and we can also apply a Layer Mask to the layer we are going to change to 'paint' back some of the original layer back through on to the altered layer if we need to later on. 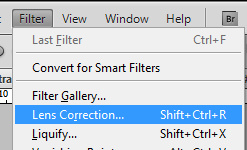 Next, go to Filter > Lens Correction and a new window will open. In this new window, you'll see various controls and a preview of our image so we can see how the changes will affect it (tick 'preview' if you can't see this). If there's a gird over your image, untick 'Show Grid' and it'll be removed. We're actually interested in the 'Custom' settings so click this tab to switch from the 'Auto Correction' options (we're using PS CS5) and half way down the 'Custom' list you'll see the vignette options. By moving the 'Vignette Amount' slider to the left you'll darken the vignette while moving it to the right will lighten it. 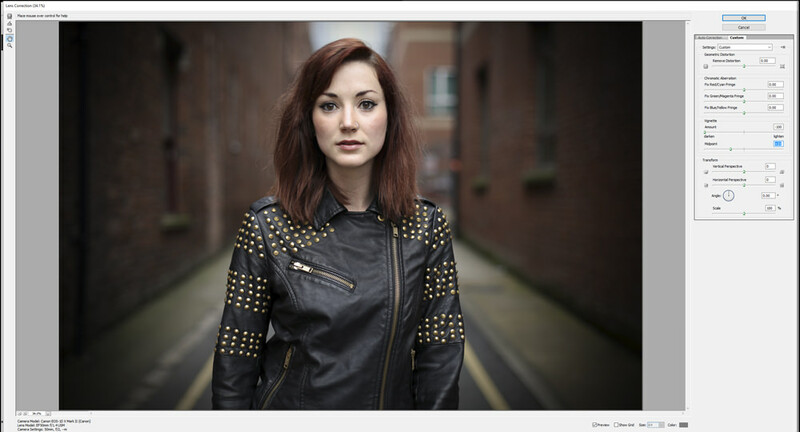 We want quite a dark vignette to add mood to the shot so have pushed the slider quite a way to the left. 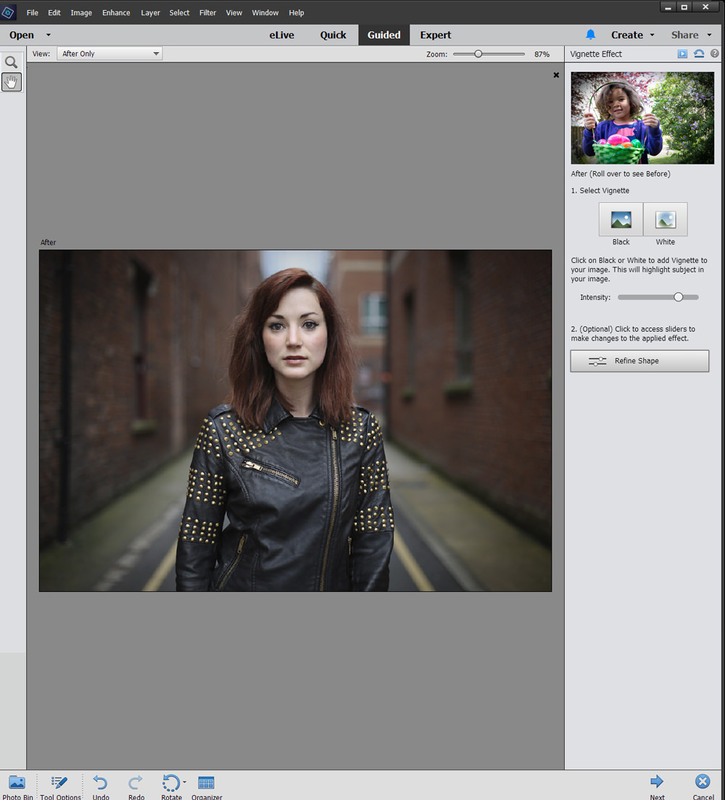 By adjusting the midpoint slider the size of the vignette will grow / shrink depending on which way you drag the slider. 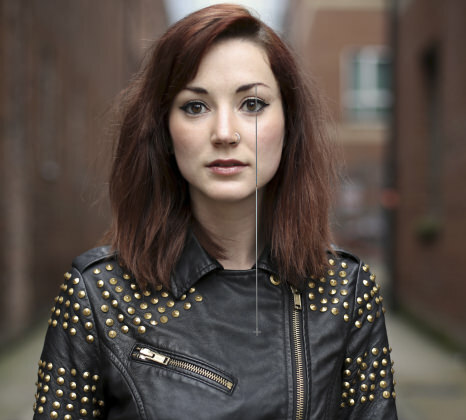 Once you're happy with your changes, hit OK.
We now have a vignette circling the edge of our image, however if you think the effect is a little strong in places you can use a Layer Mask (which we mentioned previously) to help rectify this. 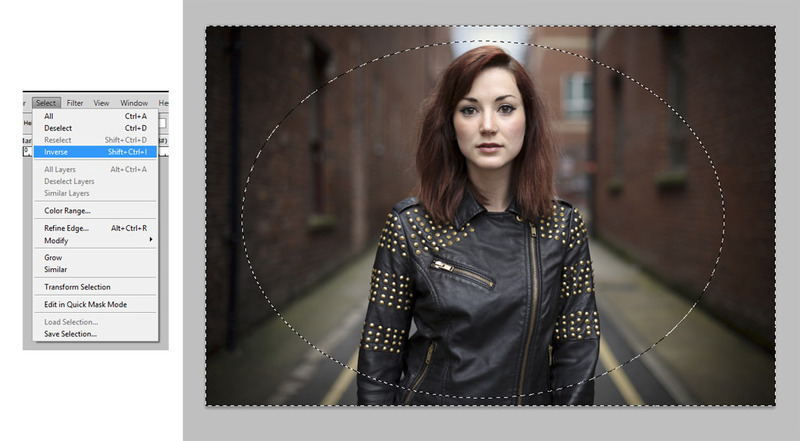 To create a layer mask, click on the icon which has a circle sat in a rectangle in it at the bottom of the Layers Palette. Select the Brush tool, making sure the foreground colour is set to black and adjust its opacity and flow so it's not as strong. Then with a fairly large brush, paint over the parts of the image you want to bring back through. Where you paint over will show up in the Layer Mask. Open your image up and create a new layer (Layer > New > Layer) then make sure the foreground and background colours are set to white and black before (red arrow is pointing to them) selecting the Gradient tool. 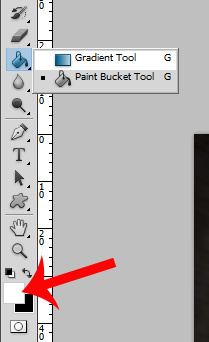 If you can't see the Gradient tool in your toolbar, find the Paint Bucket tool and click on it to bring a menu up which will have the Gradient tool in. Once selected, go to the top toolbar and select the Gradient option second from the left which shows a faded circle sat in a rectangle. This tool will form the basic shape for our vignette, with a white centre that fades gradually into a black edge. With the new layer selected, draw a line over your image while holding down the left mouse button then let the mouse button go to apply the gradient. It can be a little hit and miss until you get the shape you're looking for but do be patient and stick with it. You can also go to Edit>Free Transform and drag the gradient out to fit by dragging the anchor points that appear around the shape if you can't quite create the shape you're looking for. Our gradient is now in place but it's covering up our image (shown above). To fix this, go the Layer Blend options, which can be found in a drop-down menu at the top of the Layers Palette, and change 'Normal' to 'Overlay' or 'Soft Light'. Feel free to try the other options too but we found either of these to work the best. The image is now visible but the effect is a little too harsh and is still hiding parts of the image. To bring more of the image back through, change the Layer's opacity to around 50%. 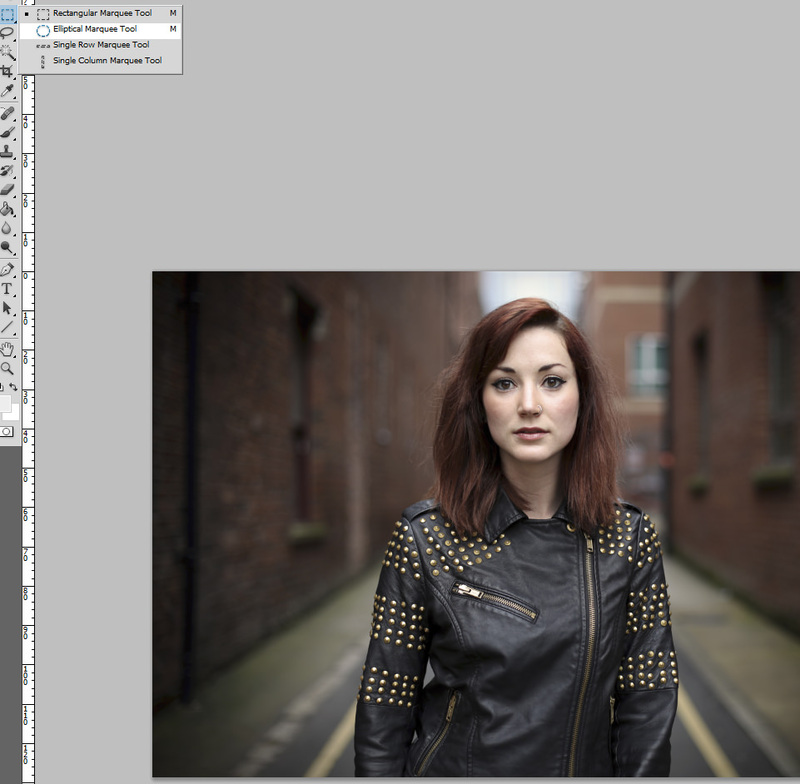 You can do this in the Layers Palette, the option is next to the Blend Modes we've just altered. The shot's looking better but there's still some parts which are a little dark so to fix this, we are going to apply a Layer Mask and 'paint' some of the detail from the original shot back through. 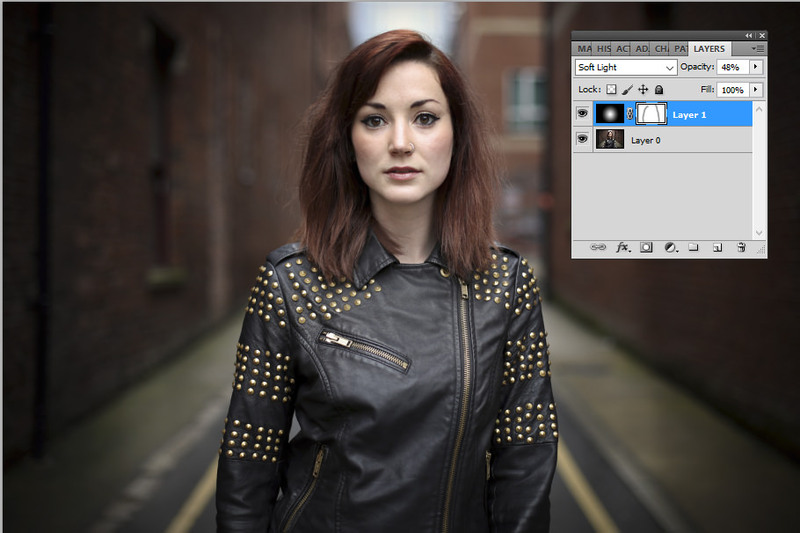 Layer Masks are really useful tools that give photographers the opportunity to get a bit more creative with their images. 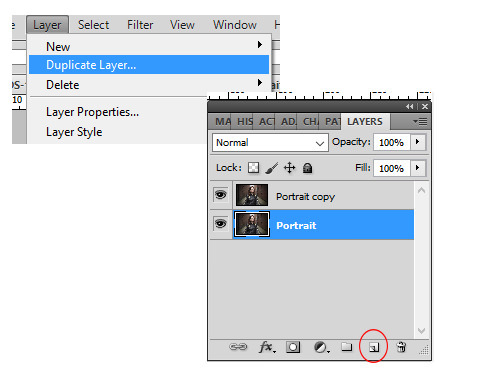 To create a layer mask, click on the icon which has a circle sat in a rectangle in it at the bottom of the Layers Palette. Select the Brush tool, making sure the foreground colour is set to black and adjust its opacity and flow so it's not as strong. Then with a fairly large brush, paint over the parts of the image you want to bring back through. We are using a soft, large brush as if we were to use a brush at full strength, the strokes we make wouldn't blend as well with the vignette. 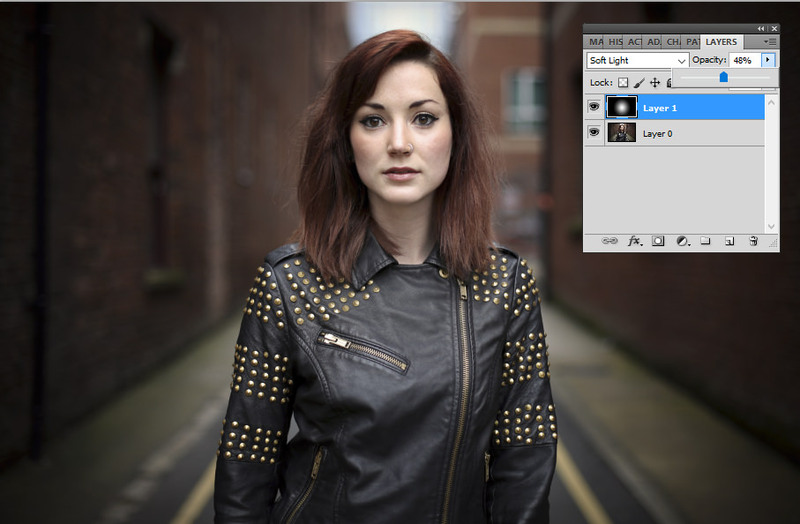 These tools are something you can use to lighten (Dodge tool) or Darken (Burn tool) parts of an image. They're a useful tool for creating vignettes as they give you more flexibility over how the final vignette will look. 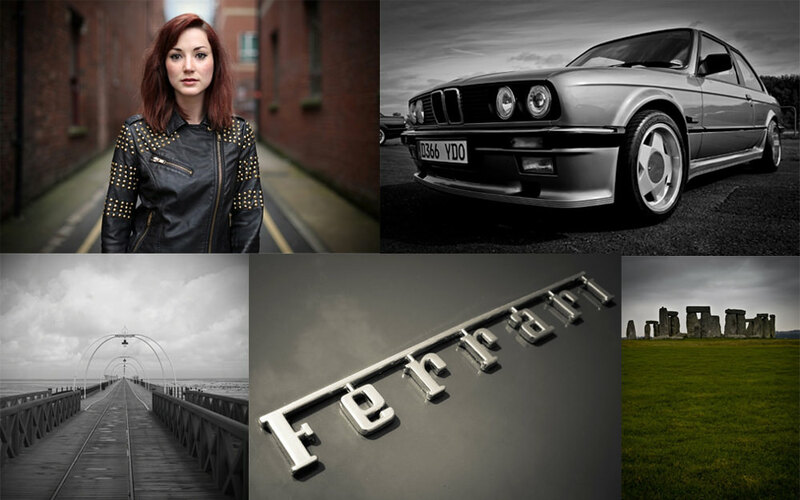 Those who once worked in a darkroom will be familiar with the Dodge & Burn tool but if you've never heard of them before, they're worth exploring as they can be extremely useful for making small adjustments to an image that really pack a punch. The changes you make are destructive so duplicate your layer (Layer > Duplicate Layer) so you can work on a copied layer as any adjustments you do make can't be easily removed without going into the history tab and taking it back a few steps. With the burn tool selected, pick a large, soft brush from the top toolbar (you can reduce the hardness of the brush you select by adjusting the slider) and get ready to paint over the areas you want to darken. Just before you begin painting in the vignette, you'll probably need to adjust the strength of the burn tool as it can be a little strong when left at 100%. 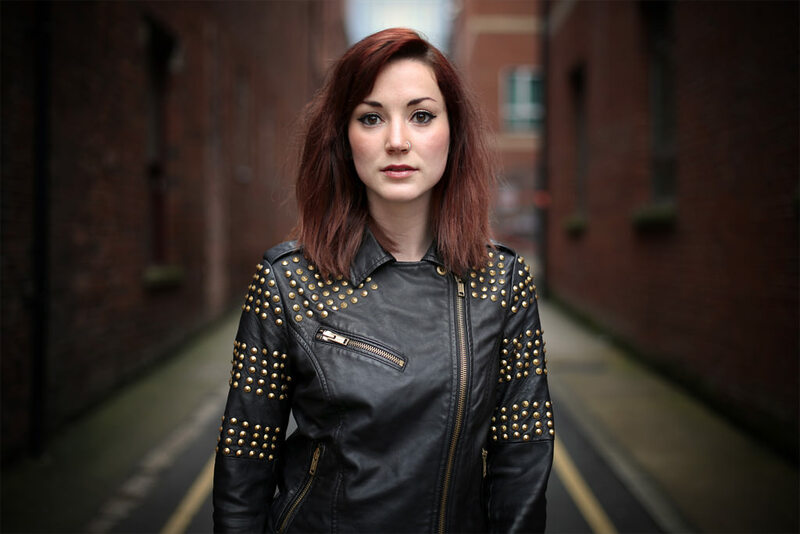 By reducing the exposure %, you'll be able to gradually build the effect up which will produce cleaner results. We are working with the Midtones as it generally works well but you can adjust this setting and play with the Shadows and Highlights if you want to. 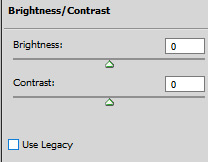 If you want a light vignette, follow the same instructions but use the 'Ddoge' tool instead. For those who are using Photoshop Elements, you actually have a really quick way to add a vignette to an image via the Guided Edits panel. 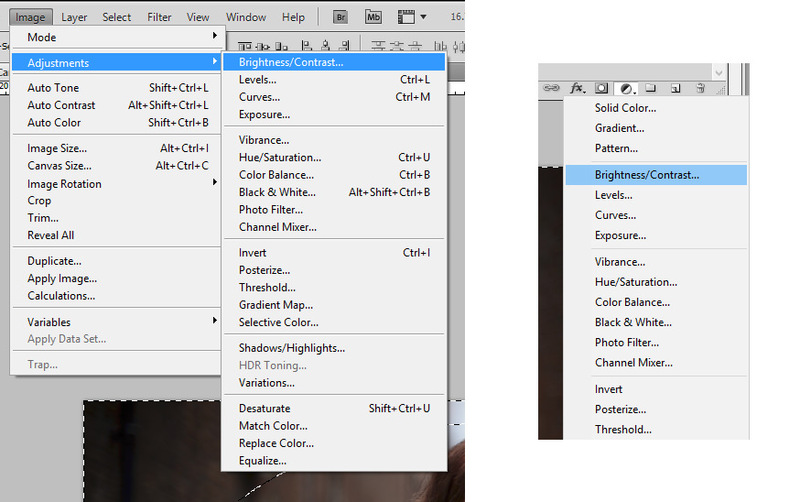 All you need to do is click on 'Guided' from the top menu and select 'Vignette Effect' (Elements 11 and newer). When the new window opens, there are options for choosing the vignette's colour as well the intensity and shape of it. 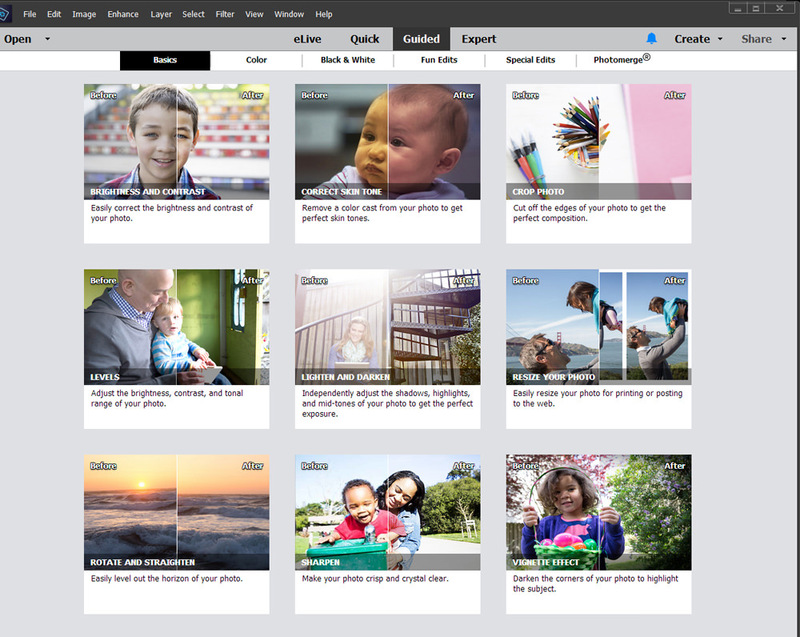 The tool is really easy to use and once you're happy with the look of your image, click 'next' and then hit 'save'. Find more Photoshop tips and techniques, take a look at our Techniques section. Bokeh is amazing! Can i know the lens you used? 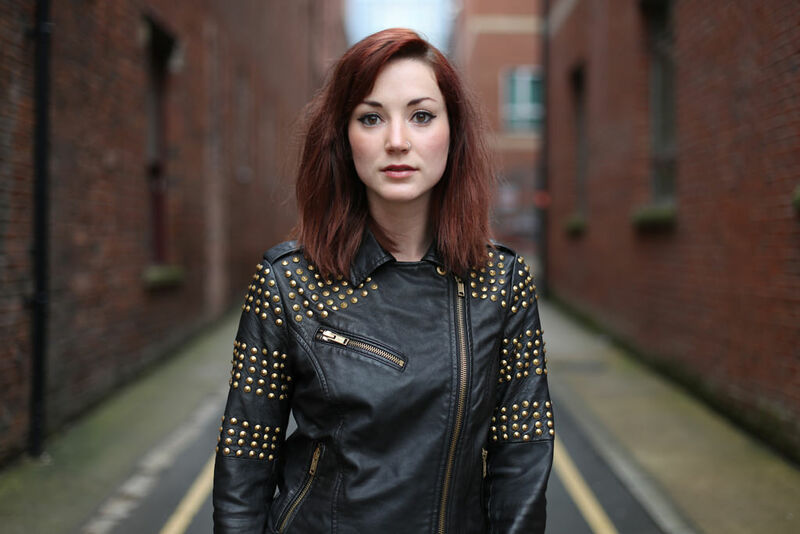 Quote:Bokeh is amazing! Can i know the lens you used? Just an observation with Marquee selection info. [quote]To create the vignette you can make a Brightness / Contrast adjustment and simply drag the brightness slider to the right to darken the selection or the opposite way for a light vignette. [/quote] The brightness slider actually works in the opposite direction. :) drag left to darken. Just an observation with Marquee selection info. 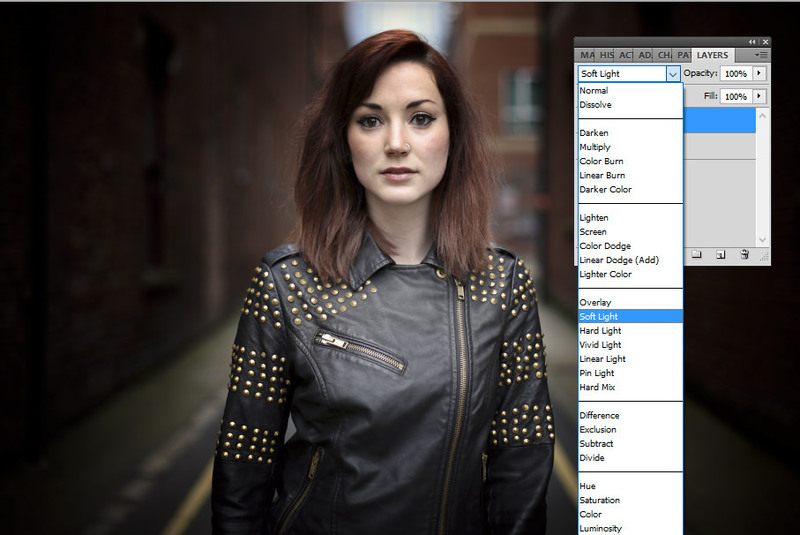 Quote:To create the vignette you can make a Brightness / Contrast adjustment and simply drag the brightness slider to the right to darken the selection or the opposite way for a light vignette. The brightness slider actually works in the opposite direction. drag left to darken.